With the $20,000 award he received for his second-place entry in the 1922 Chicago Tribune Tower Competition, the fifty-year-old Eliel Saarinen set sail for the United States in 1923 where he first settled with his family in Chicago. Although he did not have a client in mind, he occupied himself by creating a plan for the development of Chicago’s lakefront. Saarinen, who believed architecture encompassed all aspects of design, from flatware to city plans, was well known in Europe as a town planner and for his proposals for Helsinki, Tallinn, Budapest and Canberra, the new capital of Australia. His plan for Chicago was a detailed proposal focused on Grant Park and its surroundings, including bold solutions to traffic problems in the loop and an innovative underground parking lot for 47,000 automobiles. At either end of the park he situated two elegant towers, with the Chicago Tower at the southern end. 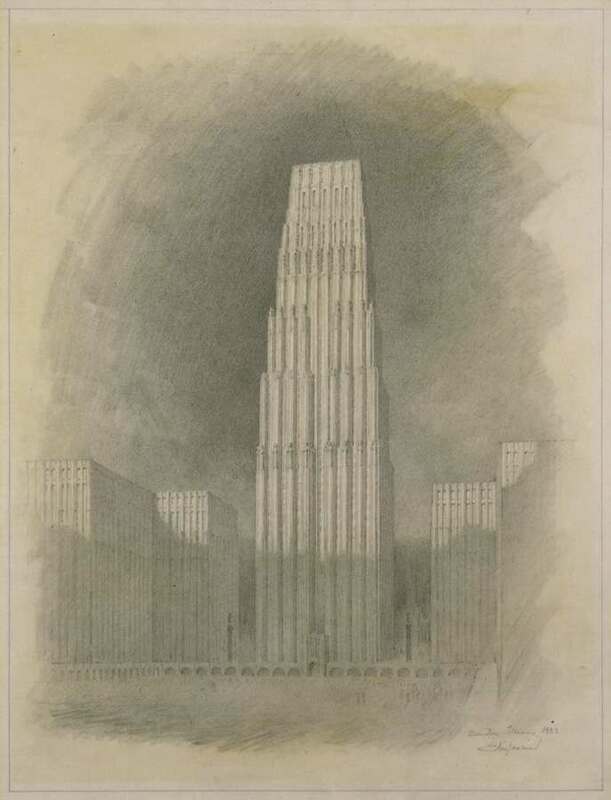 The design’s soaring verticality was softened by a series of subtle setbacks, recalling both his proposal for the Chicago Tribune Tower and his earlier studies for the Parliament House in Helsinki.